After growing up amid animated dinner conversations about the Cuban revolution and the frightening missile crisis, award-winning journalist Melinda Voss seized the first opportunity she had to explore Cuba’s complexity, its people, culture and relationship with America during her first trip there in March 2014. 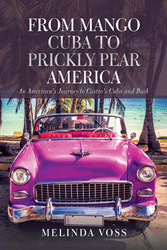 Her travel memoir, “From Mango Cuba to Prickly Pear America: An American’s Journey to Castro’s Cuba and Back,” lays bare her misconceptions and contradictory feelings about U.S.-Cuban relations. By sharing the heartbreaking realities, exhilarating experiences and poignant moments, Voss offers readers an easily digestible way to discover, understand and appreciate America’s neighbor and its people. In this concise volume, which takes about two hours to read, Voss reveals many little known and surprising details about Cuba’s history, customs, housing, education system, agriculture, health care, family life, and aging. With her keen eye and thoughtful analysis, she also provides a succinct and carefully researched comparison between two New World countries as a new and uncertain era of Cuban-American relations dawns. “I want Americans to better understand Cuba, its people and the impact that the U.S. has had on this impressive country, Voss said. “I also want more Americans to visit Cuba so they experience firsthand the island’s beauty, its rich culture and the warmth of the Cuban people.” She made a second trip to Cuba in January 2018 and plans to return in 2019. Melinda Voss was a staff writer for the Des Moines Register for 26 years, winning various national journalism awards. She has taught journalism at three universities and co-founded the Association of Health Care Journalists. Her work has appeared in USA Today, Gannett newspapers, Columbia Journalism Review, Harvard’s Nieman Reports, the American Journal of Public Health, and A Field Guide for Science Writers. Now retired, Voss lives in Saint Paul, Minnesota, with her dog, Bunny.